BYO Stories returns! 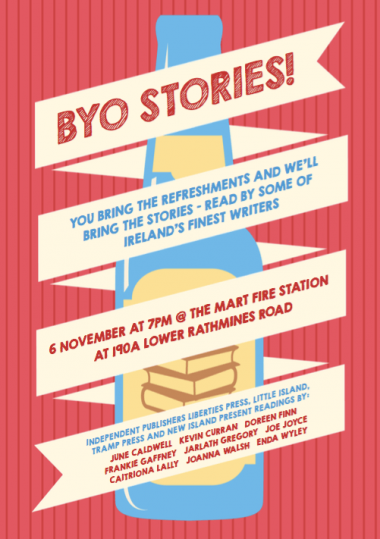 In association with some of our fellow independent publishers, Tramp Press is delighted to participate again in Bring Your Own Stories, a night of readings at the Mart Fire Station, 190A Lower Rathmines Road, on 6 November at 7pm. June Caldwell, Kevin Curran, Doreen Finn, Frankie Gaffney, Jarlath Gregory, Joe Joyce, Caitriona Lally, Joanna Walsh, Enda Wyley. In association with the good people of Liberties Press, Little Island and New Island.